If you have negotiated custom pricing or if you have a different price than the one displayed, or if you want to set a price on a machine that does not have one (OpenStack, KVM, a bare-metal server, etc.) 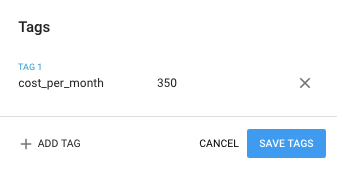 the reserved cost_per_month tag will allow you to add a new price by simply using the reserved tag along with an integer value. Mist.io will use the new price to calculate the estimated monthly cost of the machine.